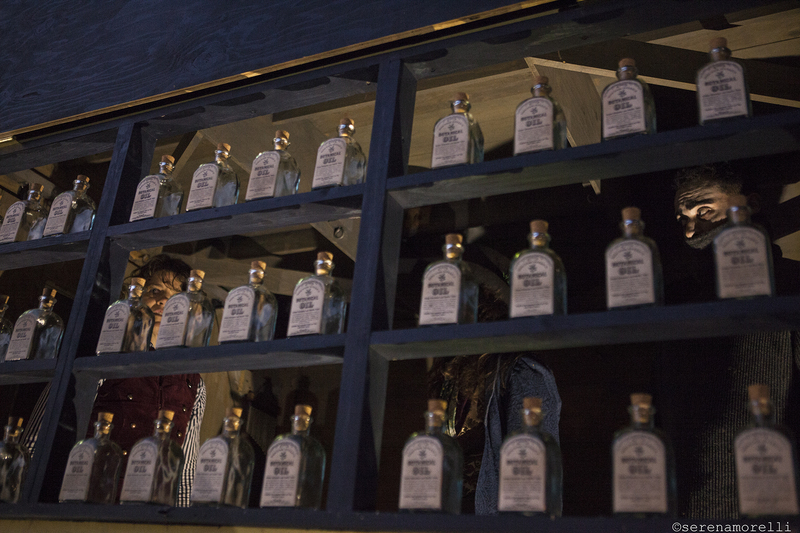 Elixir of Life production photos by Serena Morelli. 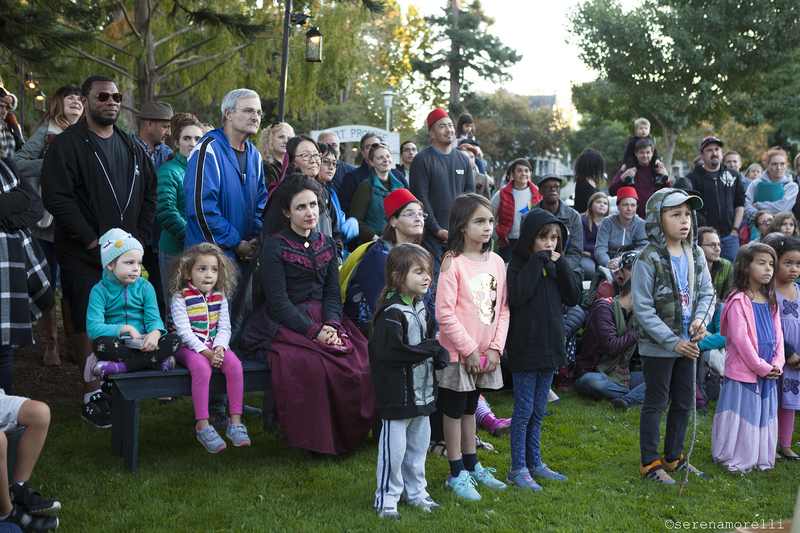 These photos were taken November 12, 2017, at Franklin Park, Alameda; special thanks to the Alameda Recreation and Parks Department. 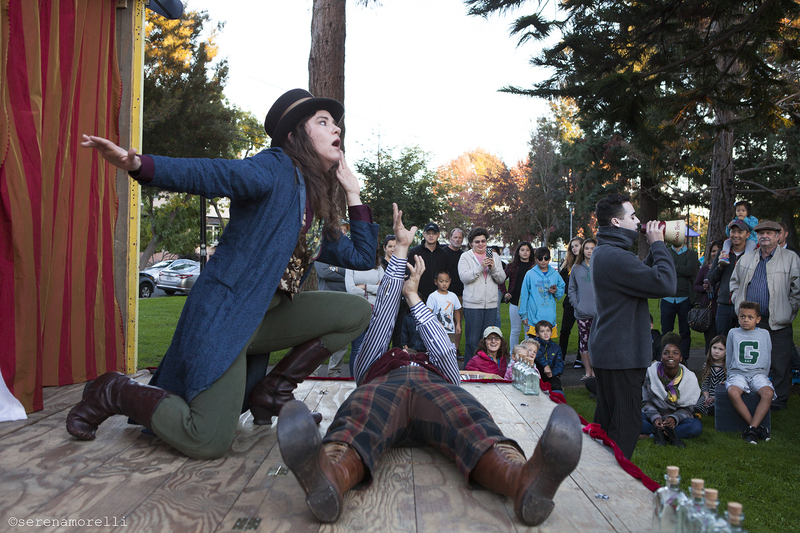 Julie Douglas as Doc Vitae (in top hat) and Maria Ascension Leigh as Josephine, with audience members and Doc Vitae’s Medicine Wagon in the background. 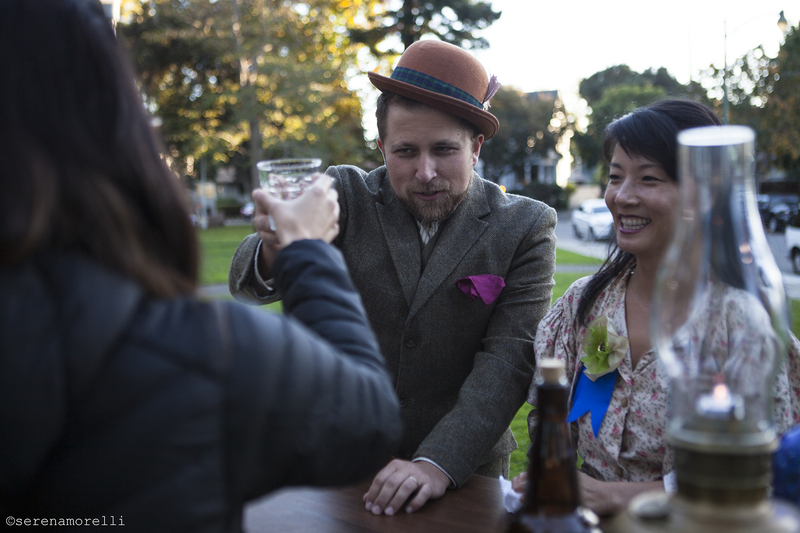 Ernest (Casey Robbins) toasts and audience member as Anita (Kristen Matia) looks on. 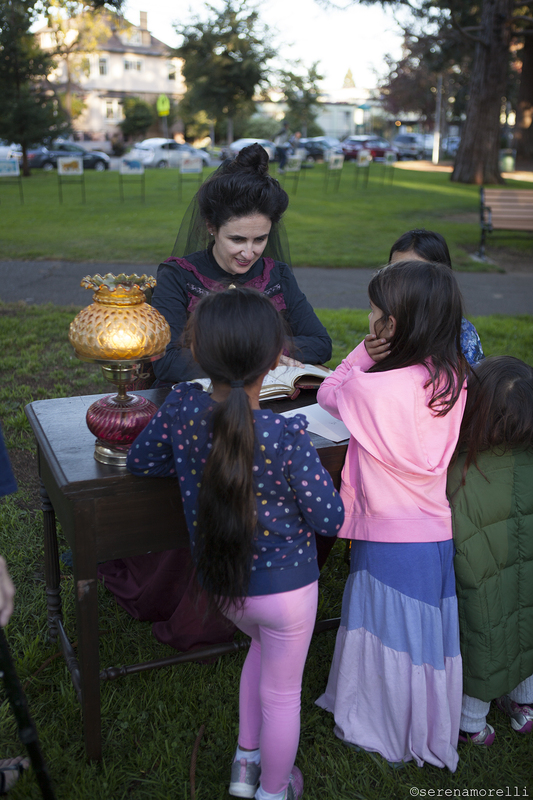 Josephine (Maria A. Leigh) demonstrates Edwardian Ladies’ Hand to a group of protoges from the audience. 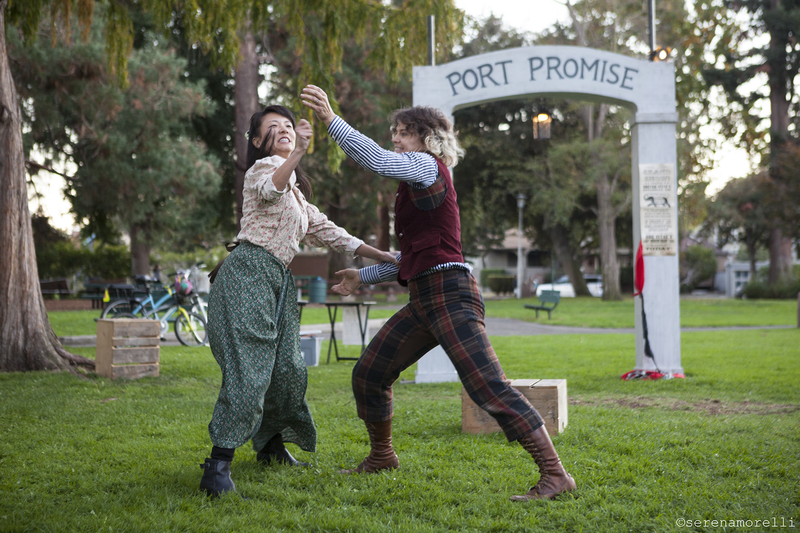 Hollow (Miyaka Pichal Cochrane) and Hobble (Joan Howard) drumming up business for Doc Vitae’s Medicine Show at the gates of town. 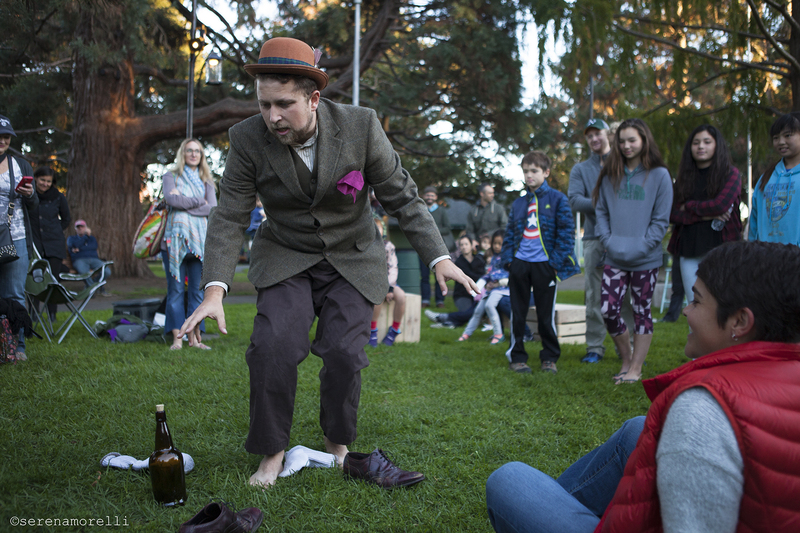 Ernest (Casey Robbins) tells a story to an audience member. 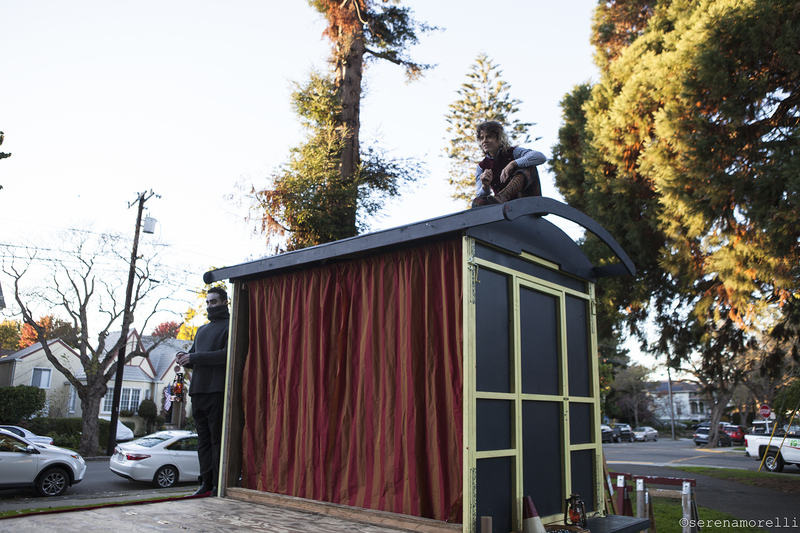 Hobble (Joan Howard, on the roof) and Hollow (Miyaka Pichal Cochrane) wait for the medicine show to begin. 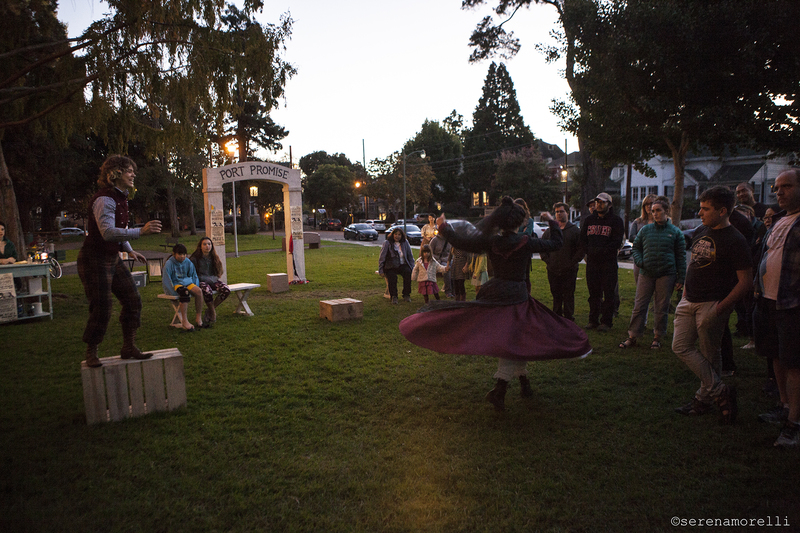 Hollow (Miyaka Pical Cochrane) calls the audience to Doc Vitae’s Medicine Show. 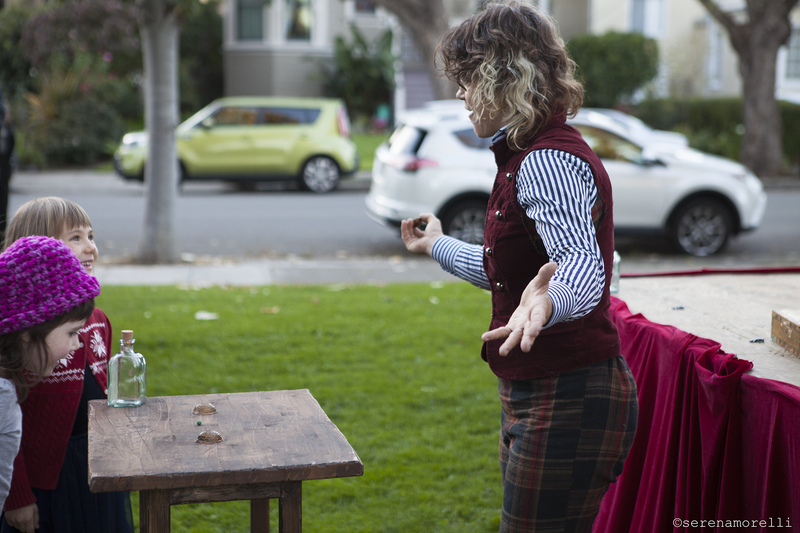 Hobble (Joan Howard) entertains the audience with games of chance before the medicine show begins. 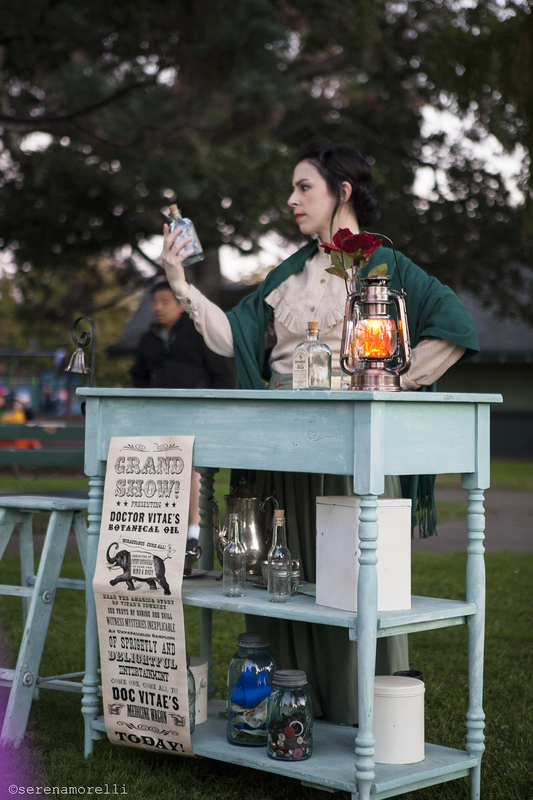 Doc Vitae (Julie Douglas) in the medicine show. 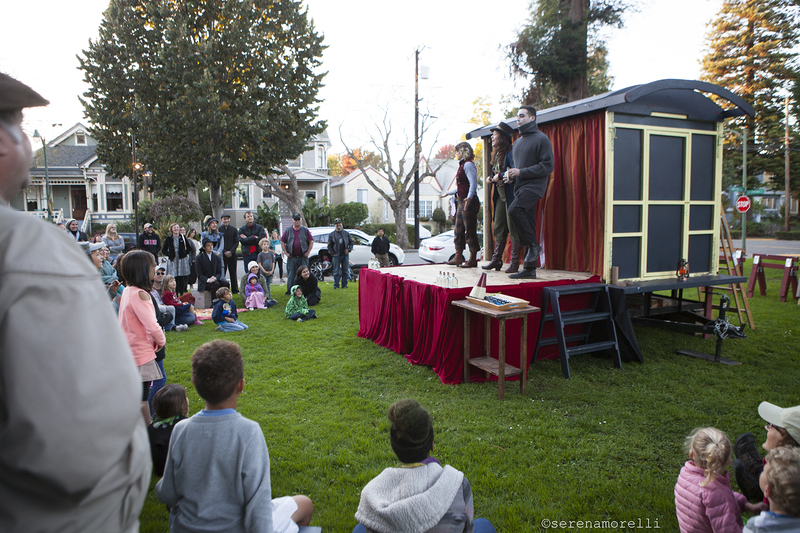 Audience members (including Maria A. Leigh as Josephine) at Doc Vitae’s Medicine Show. 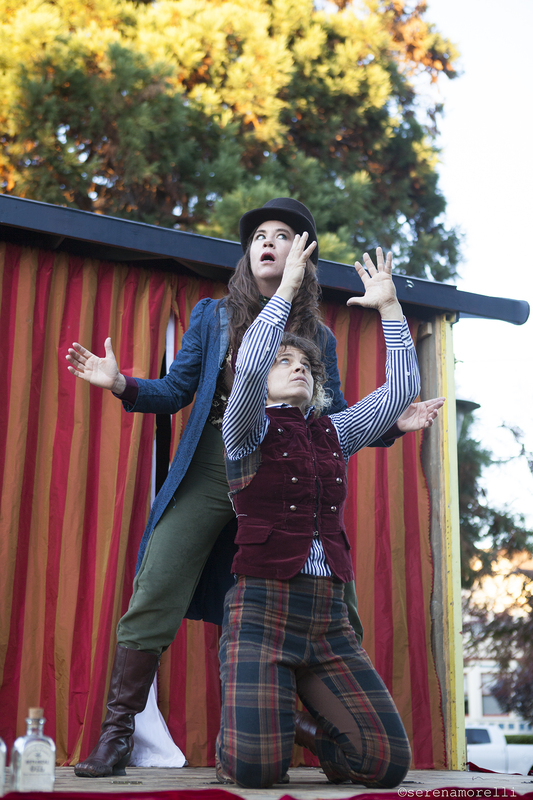 Doc Vitae (Julie Douglas) and Hobble (Joan Howard) in the medicine show. 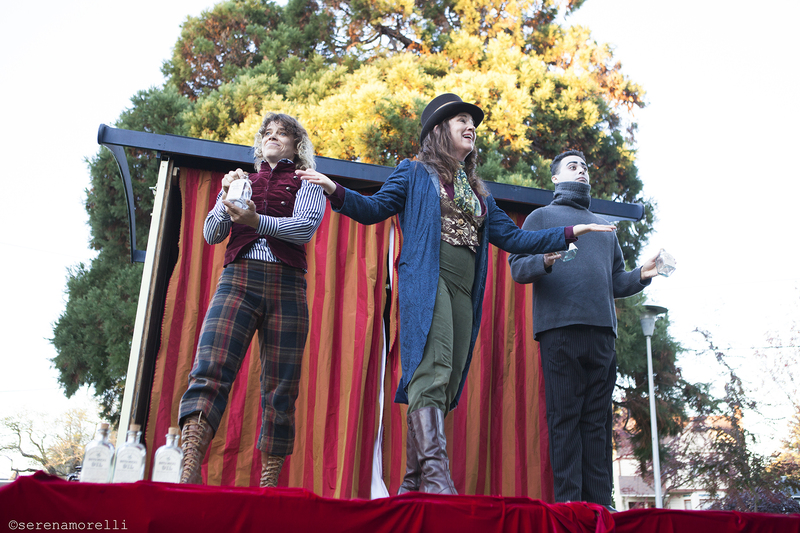 Hobble (Joan Howard), Doc Vitae (Julie Douglas) and Hollow (Miyaka Pical Cochrane) in the medicine show. 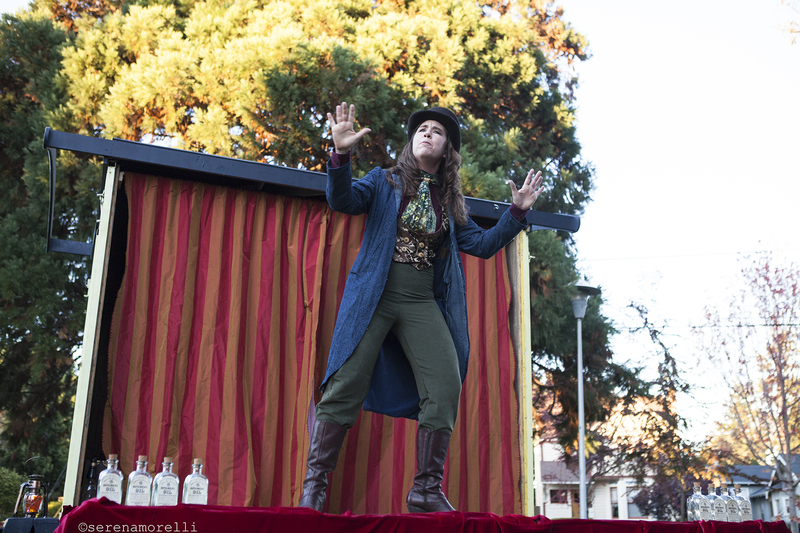 Doc Vitae (Julie Douglas), Hobble (Joan Howard) and Hollow (Miyaka Pical Cochrane) perform the medicine show. 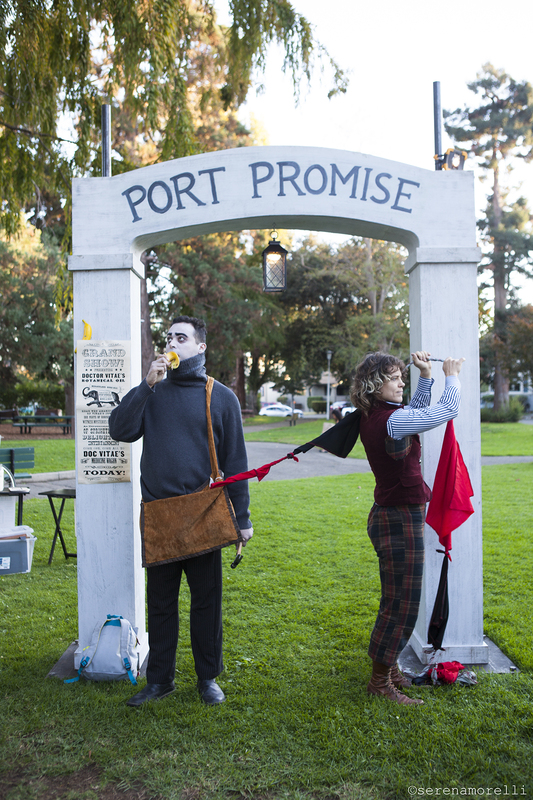 Hobble (Joan Howard), Doc Vitae (Julie Douglas) and Hollow (Miyaka Pical Cochrane) give the sales pitch at their medicine show. 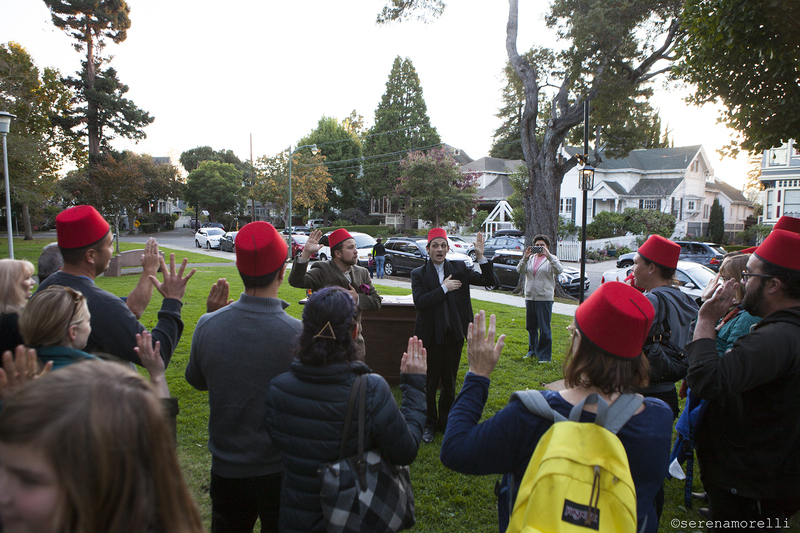 A meeting of the Promesian Sartorial and Salvational Tabulary led by Ernest (Casey Robbins) and Brother Calvin (Sam Bertken). 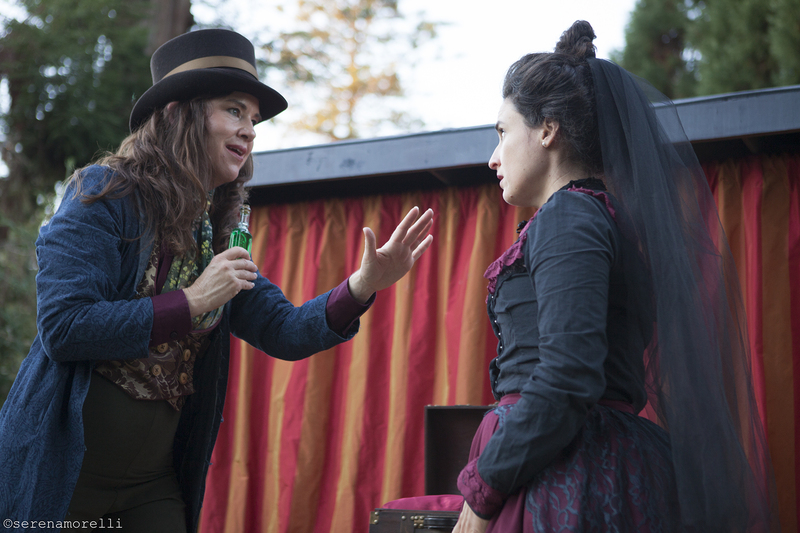 Doc Vitae (Julie Douglas) holds a private consultation with Josephine (Maria A. Leigh). 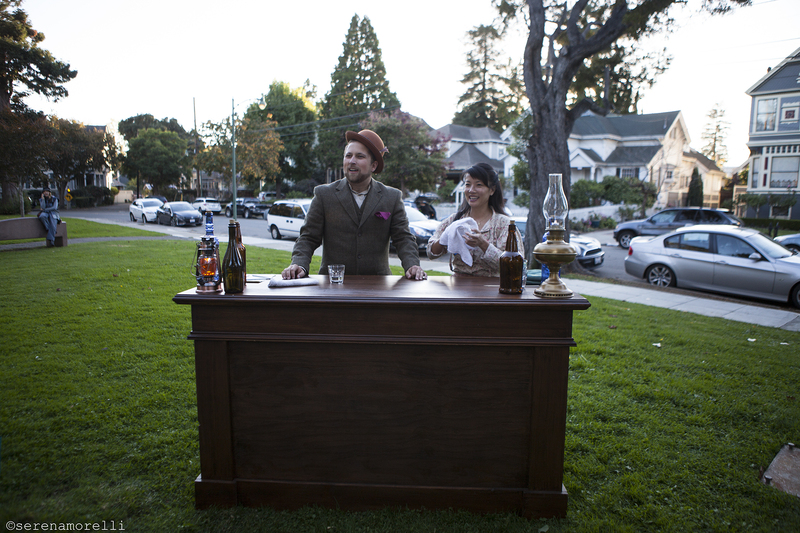 Doc Vitae (Julie Douglas) consults with Ernest (Casey Robbins). 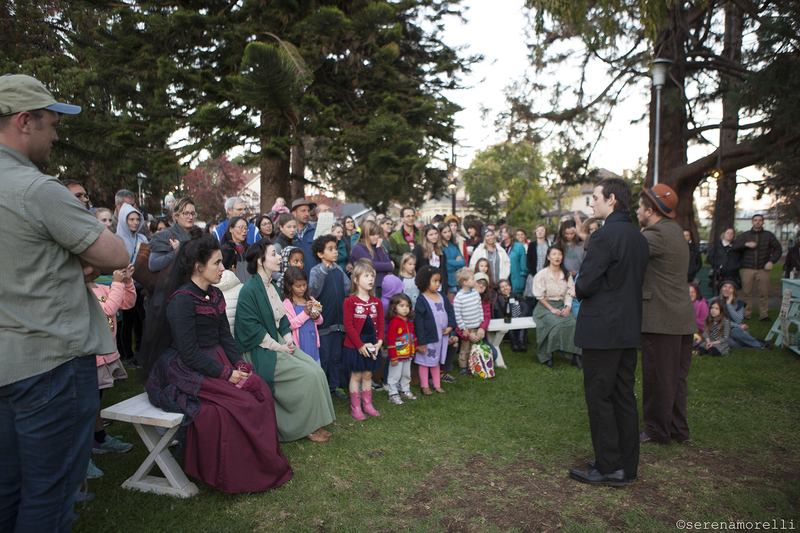 Ernest (Casey Robbins) leads townsfolk (including Maria A. Leigh as Josephine, Marlene Yarosh as Sybil, and Kristen Matia as Anita) in a hymn, at Brother Calvin’s (Sam Bertken) prayer meeting. 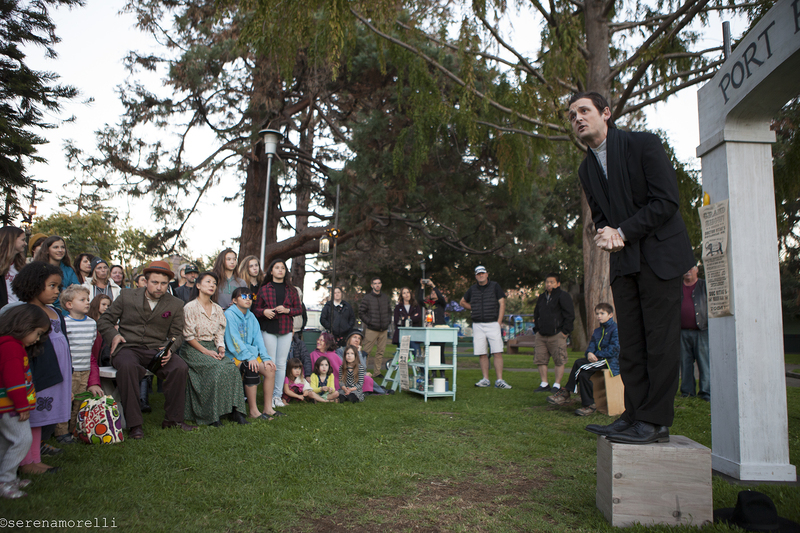 Brother Calvin (Sam Bertken) preaches to the townsfolk, including Ernest (Casey Robbins) and Anita (Kristen Matia). 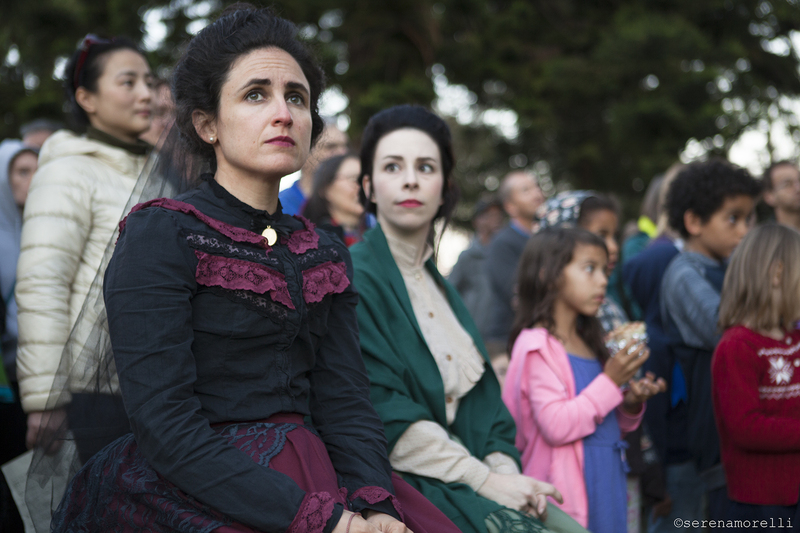 Josephine (Maria A. Leigh), Sybil (Marlene Yarosh) and other townsfolk listening to Brother Calvin preach. 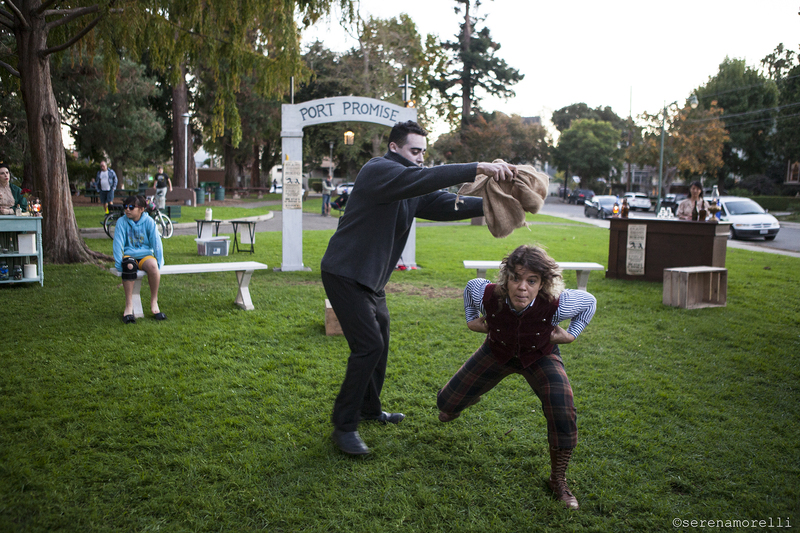 Hollow (Miyaka Pical Cochrane) tries to catch Hobble (Joan Howard) in a chicken-catching bag. 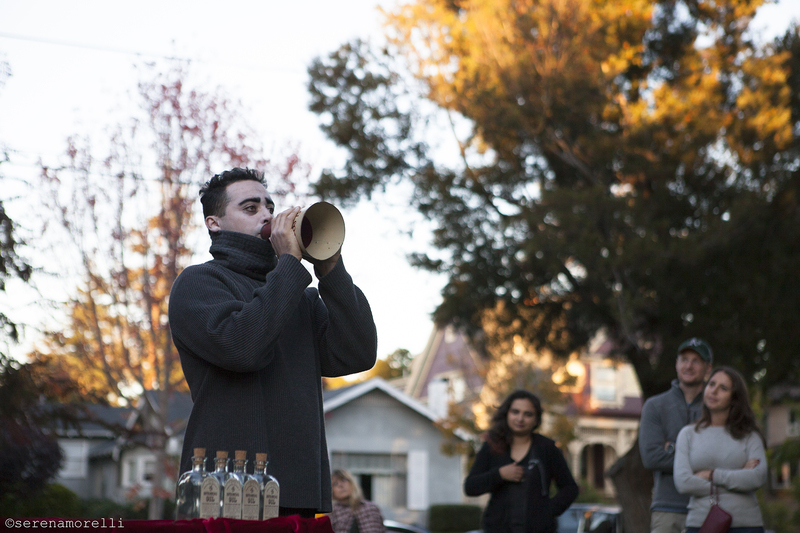 Sybil (Marlene Yarosh) reads the label on a bottle of Doc Vitae’s Botanical Oil. 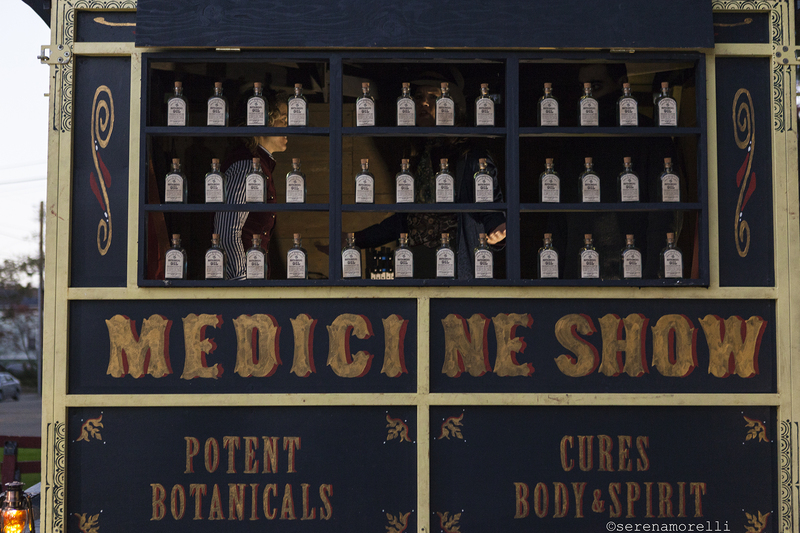 Bottles of Doc Vitae’s Botanical Oil line shelves on the windows of the medicine wagon, while Hobble (Joan Howard), Doc Vitae (Julie Douglas) and Hollow (Miyaka Pical Cochrane) have a conversation inside. 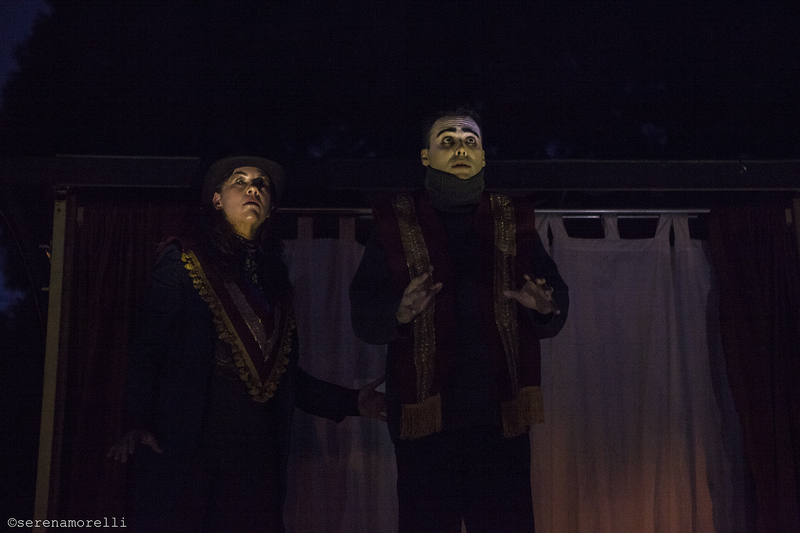 Hobble (Joan Howard), Doc Vitae (Julie Douglas) and Hollow (Miyaka Pical Cochrane) have a conversation inside the medicine wagon. 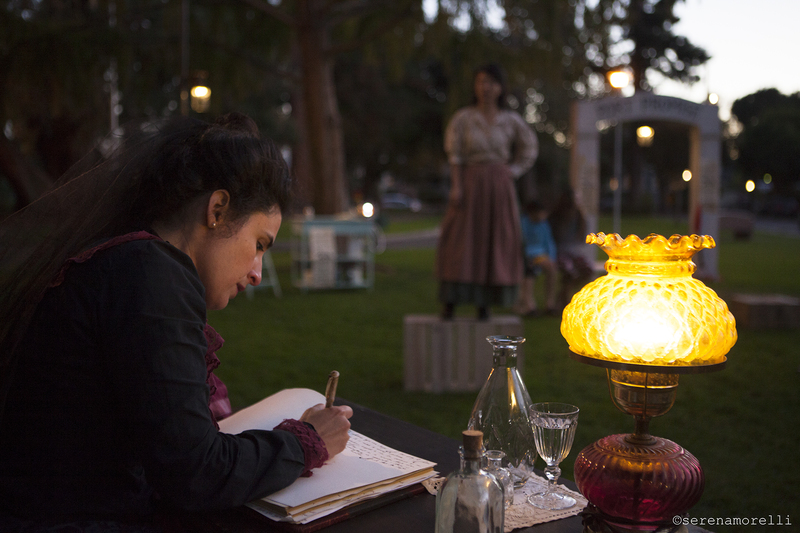 As the sun sets, Josephine (Maria A. Leigh) writes in her journal while Anita (Kristen Matia) watches from afar. 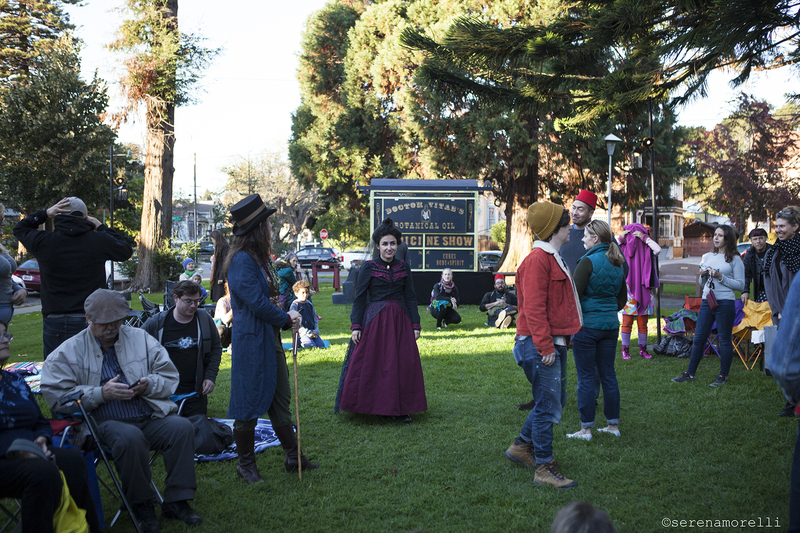 Hobble (Joan Howard) and Josephine (Maria A. Leigh) with the audience. 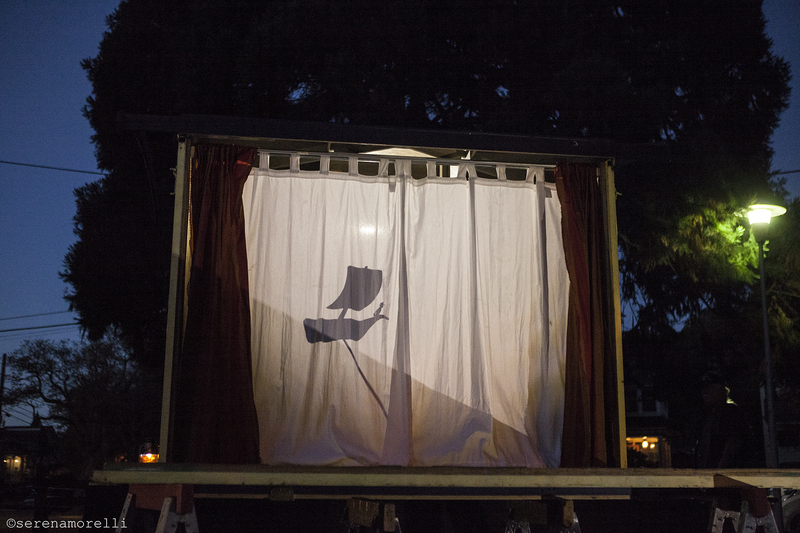 Doc Vitae’s nighttime medicine show tells the tale of the miracle elixir with a shadow play. 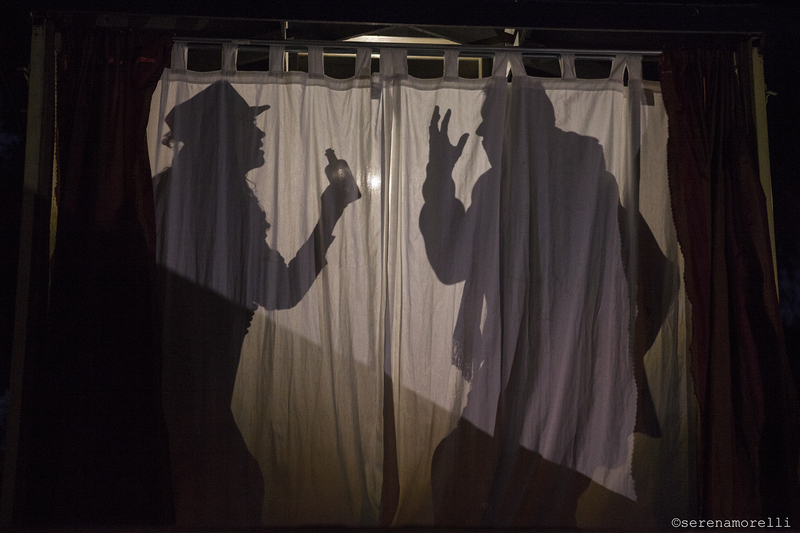 Doc Vitae (Julie Douglas) and Hollow (Miyaka Pical Cochrane) in the shadow play during Doc Vitae’s nighttime medicine show. 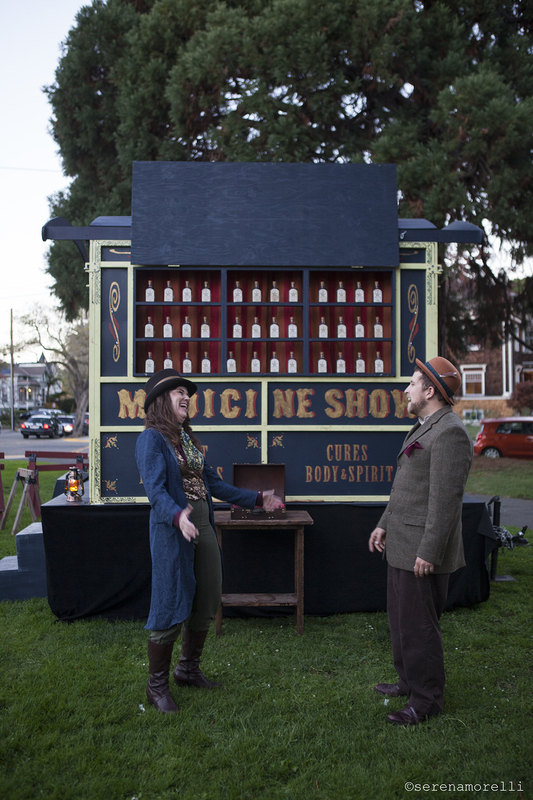 Doc Vitae (Julie Douglas) and Hollow (Miyaka Pical Cochrane) get ready for the elixir ritual at the climax of the nighttime medicine show.